Barcode label printers - of numerous sizes - are utilized each day in factories, shipping centers, industrial buildings, and harsh production areas (both inside and outside). Stainless steel, printer box enclosures, with a NEMA 4X rating, are the best enclosure solution for the food, beverage, or pharmaceutical industry. These heavy-duty printer cabinets have the capability to protect against harsh washdowns, dirt & dust, and corrosive materials. 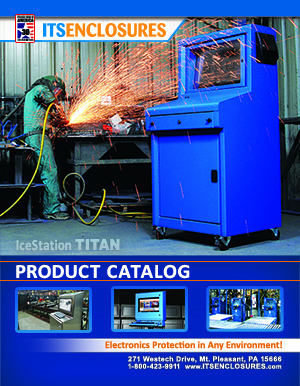 The IceStation PB20-4X printer cabinet comes standard with an adjustable sliding shelf that holds up to 80-pounds, a stainless-steel hinged printer door (the hinge can be installed to open from the top, bottom, left, or right), heavy-duty waterproof gasket providing a strong seal, quarter turn compression latches, removable solid rear panel, and a lockable front door. 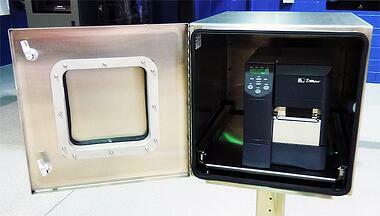 What accessories will help create the perfect NEMA 4X printer box enclosure? In order to insert cables and wires into the stainless steel printer box, one should consider installing a Roxtec cable entry gland. Installation involves punching a 2.5” knock-out and then fastening the cable entry gland into place. The gland has a module with 4 entry points (1 & 9 are also available) that will provide a waterproof and dustproof ‘round seal’ around the cables. The rubber seal functions like an onion - simply peel or remove layers to create a diameter large enough to route the necessary cables/cords. If a desk or countertop is not available, the printer box can be mounted on a pedestal. A bolt down pedestal can be anchored to the floor as a permanent fixture. In addition, a mobile pedestal - with lockable castors - can be procured to easily move the printer box seamlessly around the factory or manufacturing floor. Both pedestals are adjustable for differing operator heights. Customize the PB20-4X with various types of thermal management, including a vortex cooling unit (which requires compressed air and can provide cooling for up to 2,000 BTU) or a NEMA 4X heat exchanger (heat is removed from the enclosure and contains two 4” 100 CFM fans and mounts on the outside, flush to the enclosure). Heaters, in various wattage sizes, are also available for the interior of the enclosure to maintain temperatures for applications in freezers or cold rooms. A gas spring closure can be added to the hinged printer door on the front door. This simple, but helpful add-on is perfect for a factory floor, where production employees may forget to close the door after retrieving labels/printer materials. With the gas spring, the door will open at an 89° angle and will close on its own. For a versatile workstation, add a USB connector (or two) to the front or side of the printer enclosure for a scanning device. The USB connector can also be used for more practical uses, like charging a smartphone or tablet. Covers are also available to protect the USB connectors during a daily washdown. These PB20-4X accessories will make the printer enclosure more robust and versatile for any user. Quality printer cabinet enclosures are often less expensive than the printer that they are protecting, which make them a smart investment for any company! Nobody can afford costly downtime. Plus, the printer enclosure is built to last, so it is likely that it will house various models of printers for many years to come.